Every coup is accompanied with disorder and redistribution of property. 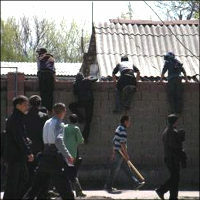 Kyrgyz revolution is not an exception. It is not surprising that interim government, illegitimately coming to power, urges citizens to observe the laws: ultimately, this is the goal of every government if it wants to remain in power. It is possible to neutralize criminal groups, stop corporate raids and punish criminals. But how is it possible to make citizens, which faced two cases of overthrowing of legitimate power and consequent redistribution of wealth, respect laws, state and private property? It looks like the deficit of legal awareness will become the major obstacle towards modern law-based society in this country. In every case of the weak government the person, holding cobblestone and stick, stands out, ready to administrate the social justice for the sake of his personal interests. This happened in 1989 when the crowds of landless peasants seized the land around the capital city. In 2005 "the land squatter", as the term, was already frequently used by politicians and mass media. Today, Bishkek faces the intensive attacks of the land squatters more than ever before. On the other hand, the actions of the interim government are not successful yet. "We have no free land in the city. The attempts to expropriate the municipal property are useless. We will not give up", warns Isa Omurkulov, the acting mayor of Bishkek. "Do not expropriate the private property. Make money", the Islamic clergy advised at the special press-conference. The non-governmental organizations and members of voluntary public order squad also failed to handle the squatters. Who are these people, ready to use the cobblestone and stick any time? Most likely, these are officially unemployed young men, working for the wealthy official or mafia boss that will ultimately take over the land. These are snakefish, making poor living in the bazaars. These are unlucky shuttle traders or small entrepreneurs that lost all their assets. These are the visitors from southern regions. They form a crowd, not only united under common goals, but also sense of fairness of their actions. The Patriot public order squad members say that "they do not even realize they are committing serious crime". The observers say that there are two groups of squatters: one group is not organized and not aggressive while another group is well managed and supplied with food. 80 percent of complaints, received by public order squad, are related to the expropriation of land. "You got your chairs, we got our land. What is wrong with that?" - You said our actions were illegal. You took over the power and chairs and we seized the land. What is wrong here? The deputy Prime-Minister had nothing to say. In response to the statement of deputy Prime-Minister, promising to allocate land in another area, the crowd showed indignant reaction. The aliens wanted to stay here, the area with decent infrastructure: electricity, water pipelines, schools and jobs. A middle-age woman gave the following explanation of her problems: "We need to pay tuition for our kids, get them married. We need our own place". She was the trader at the bazaar and could hardly cover the rental fee for a small apartment and food expenses. She came to Bishkek when the plant, she was working for in her home town, was shut down. That’s the story. On the other hand, Kyrgyz farmer was showing me his field, destroyed by cobblestones. "Look, the winter wheat is already growing. They want to build their houses here. I spent money on seeds, fuel and tractor. Who will compensate my losses?" At that time there was no bloodshed. The current situation is worse. Anatoly Oleinichenko, the head of Lenin village administration in the Chui Oblast, informed that unknown people expropriated about 730 hectares of land, belonging to the peasants, and started redistributing it between the squatters. "Today, they had cobblestone and sticks – says Oleinichenko. – They do not tolerate any objections. They have no place to live. We lost our crops". The crowd of squatters moved to Bishkek; meeting the acting mayor Isa Omurkulov the squatters claimed that every one of them has the right to have at least four hundred square meters of land. "We fought against Bakiev’s regime that promised to build the apartment buildings for us. We want to see the benefits of our efforts", they argued. Coming back to the Maevka village the crowd took another attempt to expropriate the land; as a result, two people were killed and few more were injured. The news agencies reported that the government sent the task force there. What does the popular government say? Undoubtedly, some of the disorders were organized by criminal structures. Azimbek Beknazarov, the deputy head of interim government, says the land seizure is the big fraud. According to him, the land is seized by the same people that did it before. The criminals sell land property and later on it comes out that the deal was illegal. The criminals keep money while the buyers keep nothing. "Do not get involved in such deals - the former Public Prosecutor warns – All illegally seized land property will be returned to the landlords". The law enforcement bodies can handle the criminal segment of land redistribution. However, it may happen again and again. Even the popular government is not able to solve the poverty problem within short terms. The history proves that Kyrgyz people do not trust the government for too long. Today, the opposition celebrates the victory over Bakiev’s regime. What will happen tomorrow, considering the burden of unresolved social problems? Few days ago one of the residents of Jalal-Abad said "if we have at least 10 million soms and 2000 people we can organize another revolution". There is no doubt that few more revolutions can be organized in Kyrgyzstan. Finding appropriate solutions for social problems is completely another issue.